Editors: David R. Hague, P.E., and Chad R.W. Duffy, P.E. Completely revised to support the reorganized Standard, the essential Automatic Sprinkler Systems Handbook helps you implement the 2019 edition of NFPA 13 smoothly and efficiently. In a major update, NFPA 13 has been fully reorganized by structuring the technical content in the order you need to do your job. Improve your ability to navigate and apply the milestone 2019 edition of NFPA 13 using the Automatic Sprinkler Systems Handbook. Unique in the field, the Handbook provides essential know-how and support for all aspects of your work. It's loaded with guidance, expertise, color visuals, and information -- to help ensure you're better prepared to conduct accurate and efficient system design, installation, and testing. Access the complete NFPA 13 text -- plus commentary from the foremost experts in fire sprinkler engineering, fire testing, and applications today. The Handbook is your roadmap to the 2019 edition of NFPA 13 and the latest research-based requirements for system design, installation, and acceptance testing. It includes the full, reformatted Standard text along with commentary written by leading industry experts including Wes Baker, Tracey Bellamy, Bob Caputo, Mark Fessenden, Mark Hopkins, Larry Keeping, Kevin Kelly, William Smith, Victoria Valentine, and Terry Victor. Help reduce risks and avoid fire loss with a wealth of support you won't find anyplace else. Hundreds of full-color photos, graphics, and detailed illustrations clarify concepts. Artwork provides a detailed look at the starting and stopping points of several NFPA systems including underground mains (NFPA 24) storage tanks (NFPA 22), fixed water spray systems (NFPA 15), fire pumps (NFPA 20), fire sprinklers (NFPA 13), and standpipes (NFPA 14). Project workflow diagrams and flowcharts illustrate the progress of a sprinkler project. Decision trees on protection for storage shows you how to choose the right sprinkler strategy for any facility. Other features clarify concepts and make information more accessible. Ask the AHJ and FAQs help installers avoid common errors. Designer's Corner features take a deep dive into design topics. Updated line art improves your understanding of connections. Closer Look feature provides further information on specific subjects or issues. Steer clear of issues that could compromise sprinkler operation with the 2019 edition of the Automatic Sprinkler Systems Handbook. Interested in other editions of the NFPA 13 Handbook? Use the drop down menu above to select the edition year you need. Watch this video clip by Matt Klaus discussing changes to the 2016 edition of NFPA 13 from previous editions. 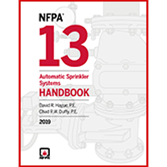 Written by sprinkler industry leaders and redesigned for greater usability, the 2016 NFPA 13 Handbook helps you implement the new industry standard. To accompany the milestone 2016 NFPA 13, NFPA® presents the fully redesigned new Automatic Sprinkler Systems Handbook. Current with the 2016 NFPA 13, Standard for the Installation of Sprinkler Systems and the latest sprinkler technology, the Handbook helps you apply scientifically-based solutions that reduce risks and fire loss. Written by the foremost experts in fire sprinkler engineering, fire testing, and applications, this full-color resource is packed with expertise, color visuals, and information that prepares you to conduct accurate and efficient system design, installation, and testing. Get equipped with essential know-how and support! Complete 2016 NFPA 13 text brings you up-to-code with the latest research-based requirements for system design, installation, and acceptance testing. Exclusive commentary explaining the intent behind provisions is written by leading industry experts, including Wes Baker, Tracey Bellamy, Bob Caputo, John Denhardt, John Deutsch, Jim Biggins, Roland Huggins, and Pete Schwab. New artwork provides a detailed look at the starting and stopping points of several NFPA systems including underground mains (NFPA 24) storage tanks (NFPA 22), fixed water spray systems (NFPA 15), fire pumps (NFPA 20), fire sprinklers (NFPA 13), and standpipes (NFPA 14). Expanded checklists and worksheets include a new plans review feature from the AHJ perspective written by David Lowrey. NFPA 13 Lessons at the back of some chapters include new storage lessons by James Golinveaux, and hanging and bracing lessons by John Deutsch. Project workflow diagrams and flowcharts illustrate the progress of a sprinkler project step-by-step. Decision trees on protection for storage shows users how to choose the right sprinkler strategy for any facility. Supplements address the European Experience wtih Fire Sprinklers; an overview of technical changes from the 2013 and 2016 editions of NFPA 13; the Evolution of Storage Sprinkler Standards; and Step-by-Step Hydraulic Calculations for a Fire Sprinkler System. New design features improve navigation and make information more accessible. Ask the AHJ FAQs help installers avoid common errors. Designer’s Corner features take a deep dive into design topics. Historical Note feature reviews some of the background behind material in the handbook. Research Note feature spotlights material based on research in the field. FPRF Spotlight covers research by the Fire Protection Research Foundation directly impacting NFPA 13 code changes for 2016. Understand vital concepts before installation and help ensure every step is done right. Gain fast access to the latest sprinkler provisions with Tabs for your NFPA 13 or Automatic Sprinkler Systems Handbook! Please note that the 2016 NFPA 13 Tabs could also be used in the 2013 edition.